June was a full degree warmer than an AVERAGE July or August! We’re not done with the hot stuff yet. The past two days my forecast has busted…yes it appears I have a “cold-bias” in my forecasting. For whatever reason (possibly the warmer than normal offshore water?) surface temperatures have been consistently warmer than one would expect with significant onshore flow (yesterday & today) and 850mb temps in the +16 to +19 range. 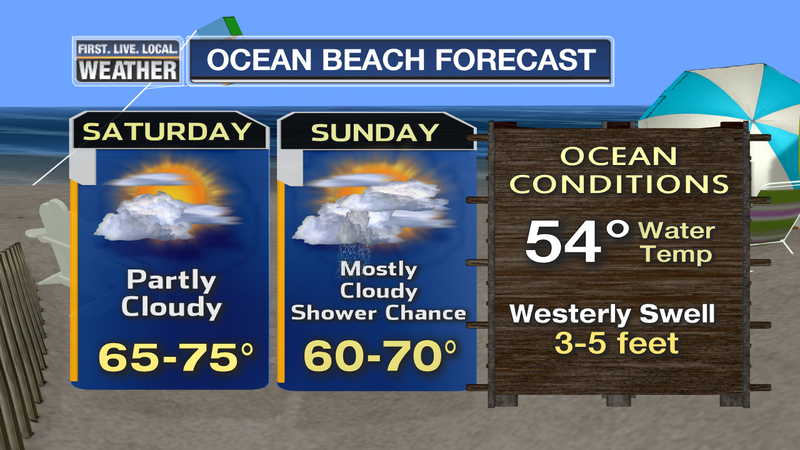 The onshore flow goes just about flat tomorrow, then back to weak onshore Thursday before strengthening Friday. As a result we should see temperatures JUMP a few degrees tomorrow. 94-97 should be common high temp numbers on the 1st of July. When will the hot weather end? The GFS says early next week high temps should drop quite a bit and it shows weak troughing nearby. 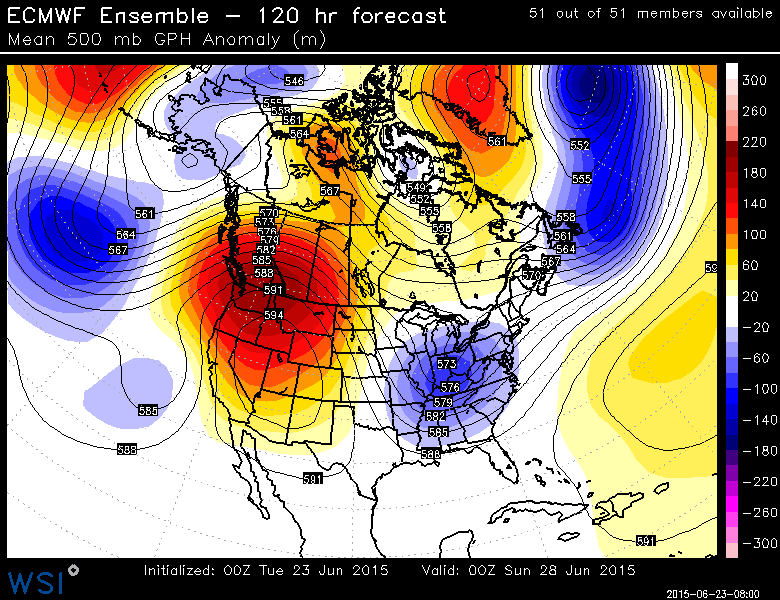 Yet the ECMWF keeps a narrow hot ridge centered between an upper-level low off California and a trough to our north. Hmmm, they are once again at odds with each other. Their respective ensembles seem to mainly support the operational runs as well. So…I’m not sure if next week is the end of the hot weather or not. 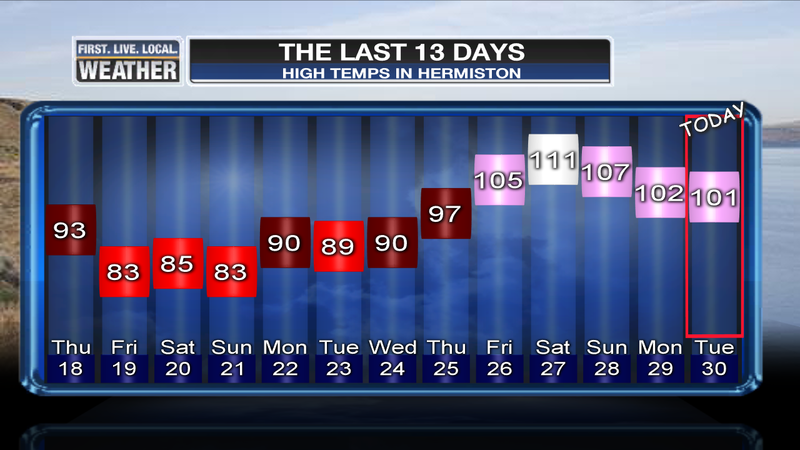 The heatwave west of the Cascades ended up pretty reasonable, except for the sweaty overnight lows of course. 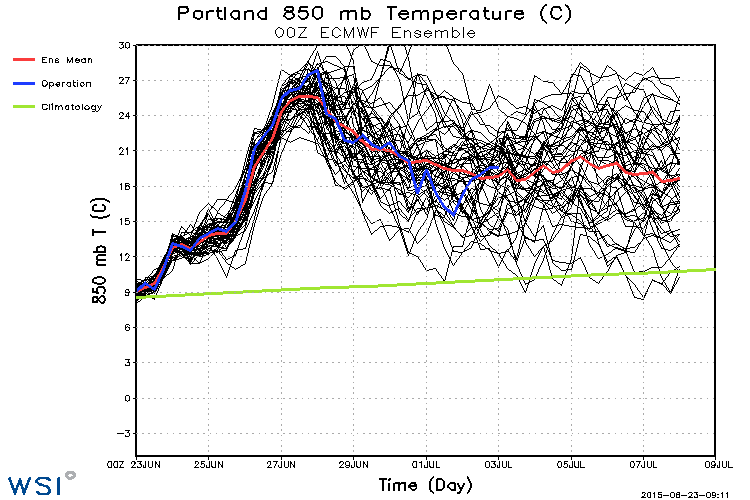 Here in Portland we just had 3 days at/above 90 degrees. Of course we were “robbed” of the 100 degree day Saturday by the thick cloud cover, only hitting 92 degrees instead. That’s okay, except for the weather geeks I’m pretty sure no one else was complaining. 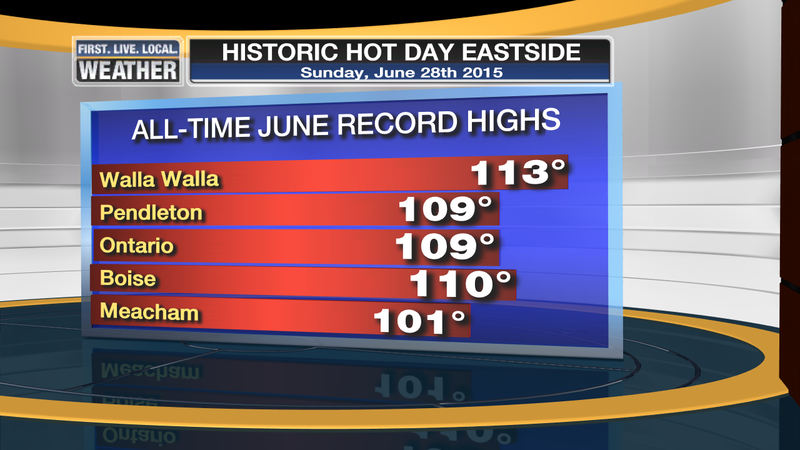 Walla-Walla at 113 was only 1 degree off their all-time high! Meacham’s 101 is the hottest day in at least the past 15 years. 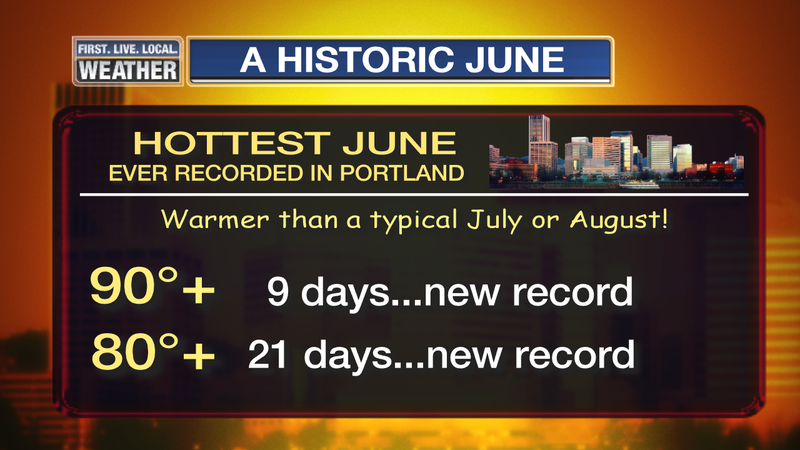 Many locations recorded their June all-time record of course. The extreme heat has been caused by an unusually strong upper-level high pressure area that’s been centered just west of the Great Salt Lake. Keep in mind that a week ago models were putting that high directly over us with easterly wind and a hotter atmosphere. If that would have occurred, west of the Cascades we would be having all-time June high temps in the 103-107 degree range! So we dodged the bullet this time around. We didn’t dodge the warm nights with the cloud cover though. 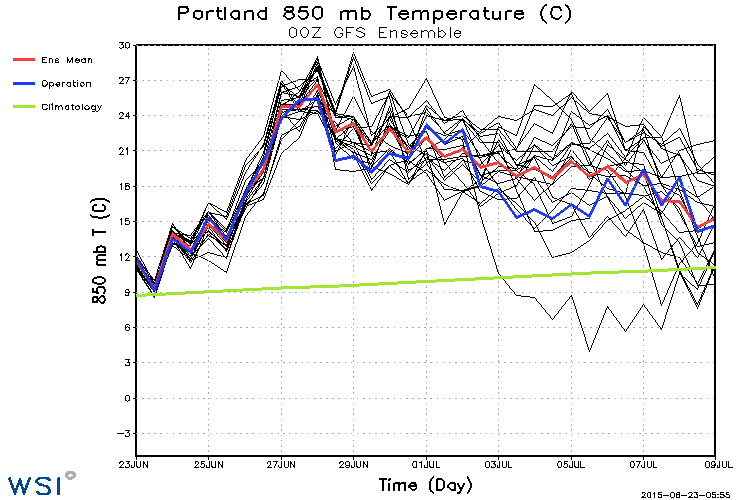 Portland only dropped to 71 Saturday morning which was the warmest June morning on record. This morning it was 70, although at 11pm we’ve dropped to 71 already, so even though we set a record, it remains to be seen if we ended up with back to back 70+ lows. If we do, that’ll be the first time since the heat wave of 2009. High and low temperatures are calculated based on a calendar day; so if you drop to 70 at 6am, but that evening at 11:50pm west wind comes in and it cools off to 69, then that 69 is the low for the day, not the morning low. Got it? The big ridge is being “dented” by a weak low moving around the western periphery of it tonight, thus the cooler temps today, tomorrow, & Tuesday. But the ridge pops back up again Wednesday-Friday…POSSIBLY through the weekend. As a result hot weather returns. 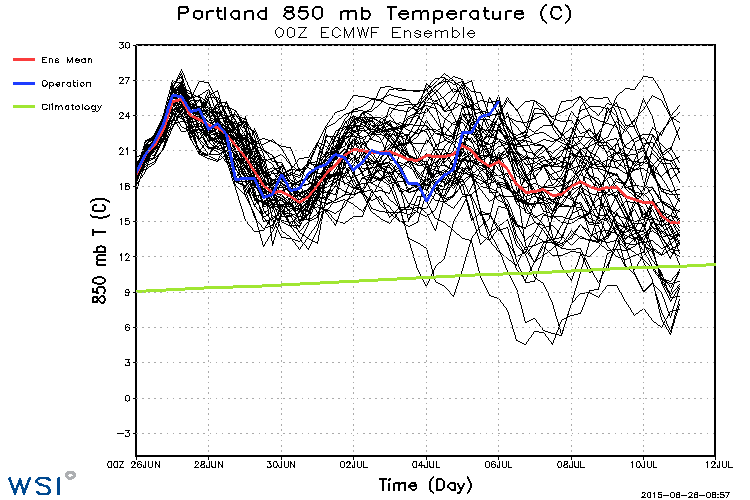 At this point we don’t see higher pressure at the surface east of the Cascades to give us a scorching hot east wind. So it’s unlikely we get up around 100 again unless that pattern develops. Regardless, a bunch of days 90+ are on the table as heat wave #2 arrives. 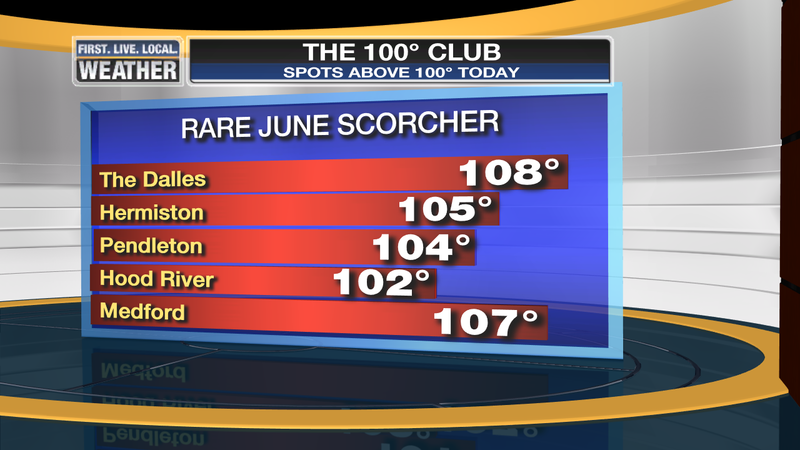 Salem hit 100 and you can check out the triple-digit heat east of the Cascades and in Southern Oregon! 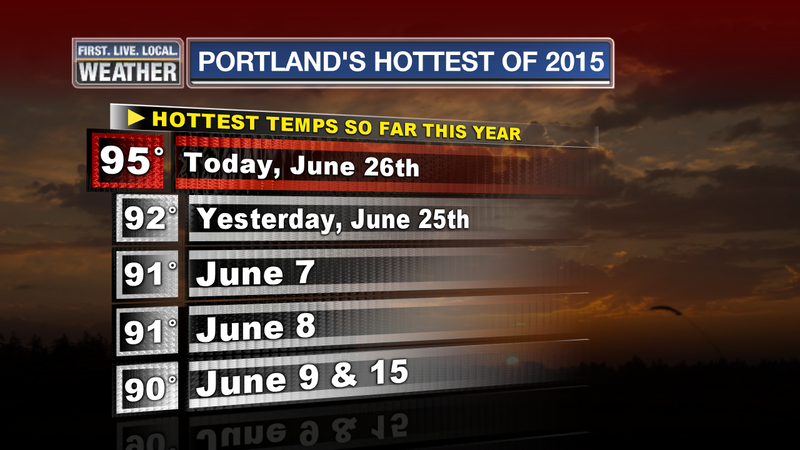 It’s been a crazy June, the warmest we’ve seen since PDX became the official Portland observation site around 1940. It’s also likely the warmest we’ve seen since record-keeping began downtown just 10 years after the Civil War! 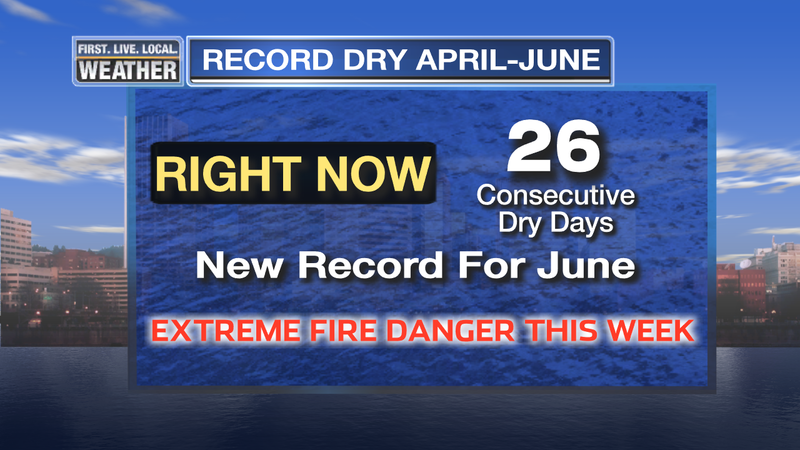 Some more records…today was the 6th day at/above 90 degrees here, which ties the June record. We’ll break it tomorrow. Thunderstorms did develop as expected in the central/southern Cascades and they lasted long enough for one strike up around Detroit. They are done now but expect another round tomorrow afternoon/evening farther north. We MIGHT see some lightning to our east this time Saturday evening. Still a chance for a thunderstorm through the day Sunday, then increasing onshore flow plus best dynamics shifting the action north and east mean we’re done with that threat. Once we get past a scorcher tomorrow (slightly warmer with light wind), a good marine push plus lots of high/mid clouds Sunday means at least a 10 degree drop in high temps. Temps stay reasonable Monday-Tuesday…in the mid-upper 80s, then a 2nd heat wave arrives Wednesday through the 4th of July. How hot is “Round 2” going to be later next week? Morning models were real scorchers with easterly wind likely pushing temperatures to around 100 again over Independence Day weekend. 00z GFS not quite as crazy, but it’s pretty clear we have a 2nd heatwave as we head into the the 4th of July holiday weekend. Temperatures will approach 100 degrees this afternoon in the metro area as everything appears to be in place for a 4-7 degree warm up from Thursday’s temperatures. 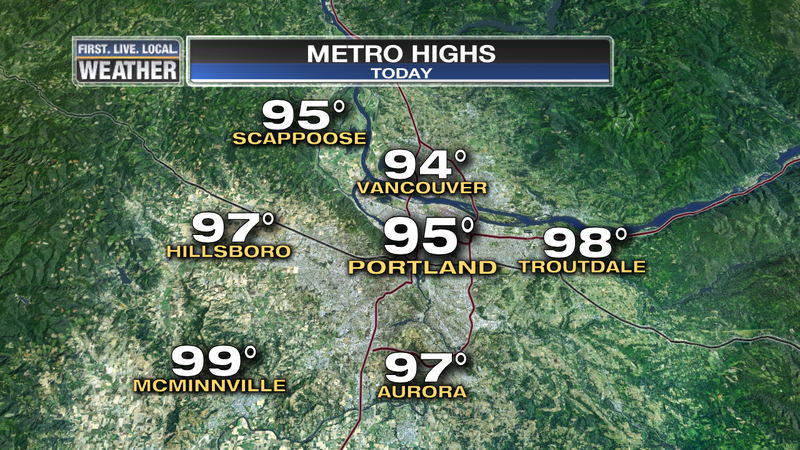 We were 91-94 in the metro area Thursday, so that puts us in the 95-100 degree range by 4-6pm. 1. 850mb temperature was 21 deg (C) on the morning sounding over Salem, headed for around +24 this afternoon. If we had easterly wind all the way down to sea level (through the Gorge), this atmosphere would allow a high temperature 100-104 in P-Town. 2. Onshore flow is weaker through the Gorge and winds have turned offshore above the surface. Yesterday it was 1-2 millibars, right now only 0.7 between PDX-DLS. West wind has pretty much shut down at the surface now east of the Coast Range. Up above, sounding shows northeasterly wind all the way up to around 6,000′. Onshore flow is SLIGHTLY stronger up the Columbia River this morning; that accounts for the high dewpoints (near 60) and humid feel to the air. I have a feeling some of that will “mix out” this afternoon since it’s such a shallow layer. Still, dewpoints will likely remain in the 55-60 degree range all day, slightly humid for our area. We’ll see if they jump this evening. 3. Skies are totally sunny, except for some smoke approaching from the south. Fires in Southern California and near Lake Tahoe have put a layer of smoke into the atmosphere (way up) and it has made its way into the southern half of Oregon. The southerly wind higher up around 8,000′ and above will push that farther north. Might be a nice reddish sunset tonight. My guess is that we’ll need to get used to fire smoke much of the rest of the summer with big fires already burning in Alaska, Western Canada, & here in the USA West. 4. Temps are running warmer in the hills already at 9am. Wanderer’s Peak SE of Estacada (at 4,400′) is already 80 at 9am! It was 68 at the same time yesterday. You see the dip Monday/Tuesday, then the rise through the 4th of July weekend, then FINALLY a drop to just a bit above normal the week after the 4th. There is disagreement among models with respect to details for the big holiday weekend. It will definitely be very warm, that’s not an issue, but at times models have been showing a shot of cool air into Montana and its associated high pressure allowing a thermal trough to develop west of the Cascades. That is a classic extreme heat situation. A bunch of our 100+ days have occurred in a scenario like this in the past. So part of the 3 day period (Friday-Sunday the 3rd-5th) could be scorching hot OR it may just be 85-90 degrees with weak onshore flow. The 12z GFS and last night’s ECMWF show the first scenario. Main message here is that unusually warm weather continues for at least another 10 days. The hot weather arrived today, a day earlier than I expected. I forecast 88 but instead PDX hit 92! This was the 5th day this June with a high temp 90+…we’re only one day away from a June record too. 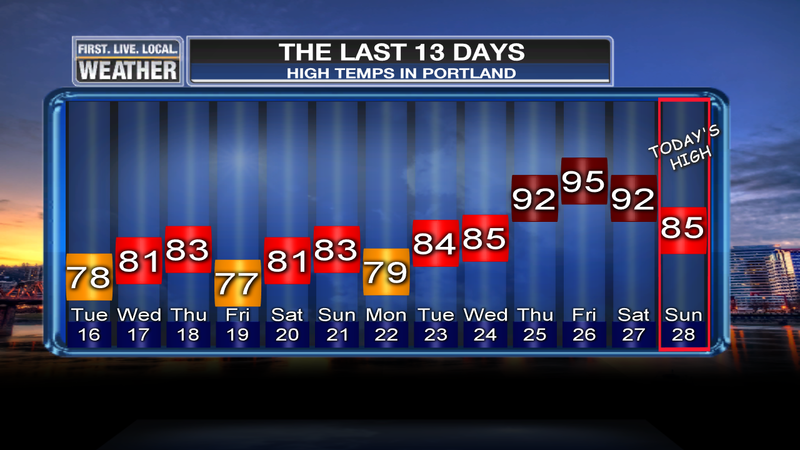 We’ve never seen more than 6 days 90+ here in Portland. There is some good news though. After a scorcher Saturday models are showing more mid-high cloud cover Sunday. Plus at the surface a decent onshore push of cooler marine air cools things off too. As a result, the heat wave has been shortened to just today through Saturday. Temps Sunday-Tuesday will likely only be in the mid-upper 80s. 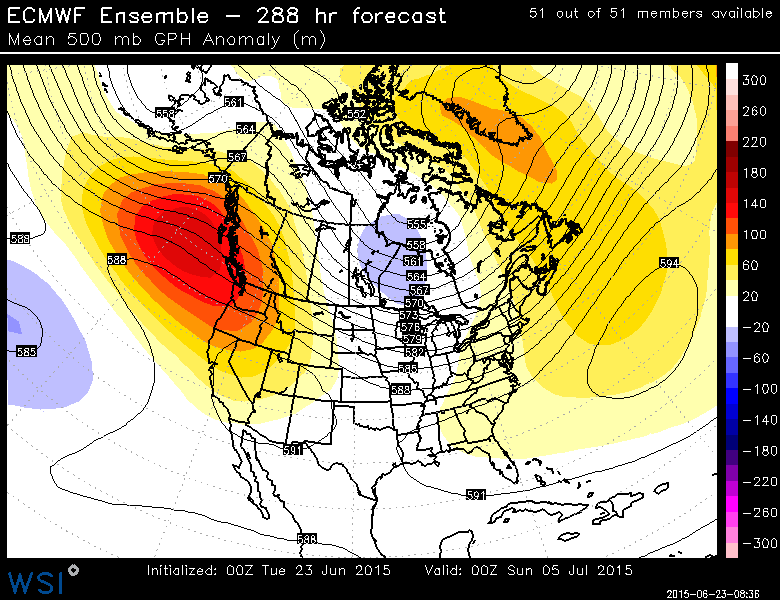 The big ridge of high pressure rebounds a bit the 2nd half of next week as we head towards the 4th of July Weekend. I think we’ll see high temps back into the 90s Wednesday/Thursday, and possibly into Friday & the 4th. That’s how we could end up with a 2nd heatwave. Not much has changed in the past 36 hours. Hottest weather is still Saturday with the pressure gradient going flat and light easterly flow overhead. That, mostly sunny (or all sunny) skies, plus 850mb temps around +25 tell me 100 is still an excellent forecast for Portland & Salem Saturday afternoon. Could be anywhere between 98-102 I suppose. WRF-GFS looks a little more like the ECMWF showing convection (thunderstorms) staying mainly over and east of the Cascades. Could be a wild afternoon Saturday at the mountain lakes in Central Oregon. There’s a very obvious marine push Saturday night west of the Cascades. That plus some leftover high cloud cover could knock our high down 10 degrees to right around 90. A bit more cooling Monday drops us into the upper 80s. So will a high temperature around 100 be the warmest this year? Could be. Last year we hit 99 on July 1st, then hit that number again the 2nd week of August. 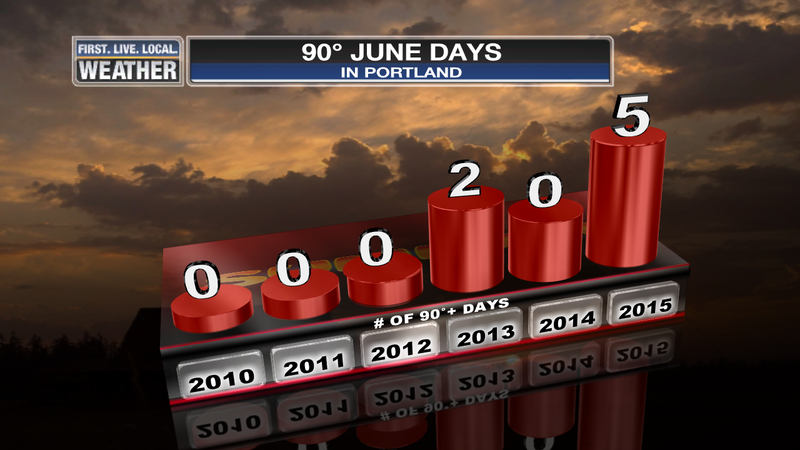 In 2013 the high on June 30th WAS the warmest of the season. So don’t freak out thinking that 100 now must mean 105 in late July…it may not. Our longest heat wave/hot spell since 2009 is in the works this morning. 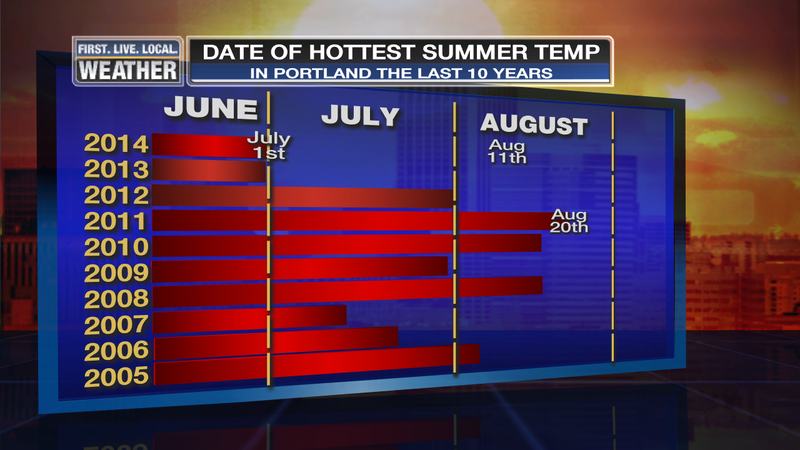 That was the year we hit 106 two days in a row and broke a record for consecutive 90 degree days…10 days! The bad news? We likely have a long period (7+ days) of 90 degree or higher temps on the way, the longest since 2009. The good news? At this point it doesn’t appear we’ll get much above 100 degrees, if at all, so at least it won’t be too extreme. 1. Hot weather (90 or higher) begins on Friday and appears to last THROUGH MOST OR ALL OF NEXT WEEK! 2. Hottest temps are likely Saturday, although Friday and Sunday will be close. I think we may just touch 100 degrees Saturday, or it could be another one of those 99 degree days like last summer…we did that twice. 3. With a lack of dry east wind, it’s possible we get into a humid situation through this heat wave. 4. That lack of dry east wind also means it’s unlikely we get the really extreme temps…like 102-107 degrees, that we often see in shorter heat waves. 5. We may (or may not) see some thunderstorm action either Sunday or Monday, right now only one model is showing that setup. I had yesterday off to do some things with the family and the bizarre “July in June” weather was great! My garden is the best it has ever been this early in the year due to the abnormal heat. The funniest part of the weekend was Sunday when I was looking for an air conditioner for my elderly parents (thought it would be bad if the weatherman’s parents were suffering in the heat). My kid’s say “hey, your forecast is on all the fans!”. 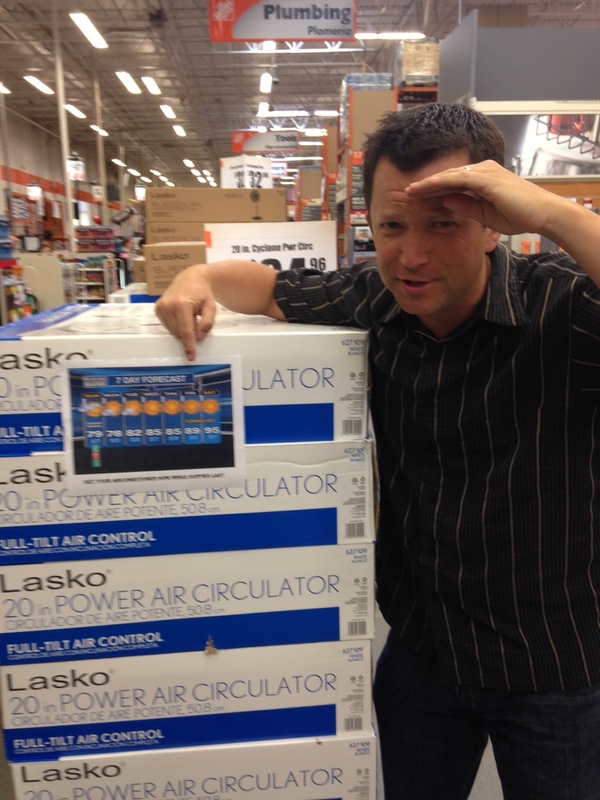 Sure enough, the Home Depot in Troutdale was using our forecast to pump up those sales! Good stuff, and I’m confident they will be gone within a few days. Too bad I don’t get some free decking lumber in exchange, but that would be Payola. So I’ve perused the maps and models and two thoughts come to mind. It’s not quite as extreme with the temp going down a bit more, but still a long very warm/hot period. A scorcher for the entire west. Hate to be in Boise this weekend! IF the ridge was to be centered directly over us, as models had shown late last week, we’d be a good 5-10 degrees hotter. Not quite as hot, but still it prolongs the heat wave. The ridge is trying to pop up back in its preferred position this past fall/winter/spring…a bit to our west/northwest. I noticed the operational run of the ECMWF has 500mb heights above 588dm from Thursday PM through the following Thursday…a very long period. Other models are similar but with varying details of course. Your first thought is likely…”what does Mark consider extreme heat; sure looks like it to me“. I mean 100 degrees and beyond. As of this morning, models are not showing offshore (easterly) flow except briefly (and weak) Saturday morning. For our extreme heatwaves in the past, where we see several days in the 102-107 range, we get a sharp thermal trough of low pressure west of the Cascades (in the valley or even at the coast) and gusty easterly wind through the Gorge and over the Cascades. Because the upper-level ridge is centered to our east, the thermal low is as well. I remember learning that way back around 1992…in fact I think George Stephan taught me that the shape/position of the thermal low/trough is usually similar to the ridging and I’ve noticed that over the past (shudder) 23 years since that time. To get a sharp thermal trough westside (and extreme downslope heating) you need a ridge right overhead or to our north (90% of the time). To make a long story short, we’ll have weak onshore flow during most of this hot spell. That may lead to another unusually humid hot spell too, we’ll see. As for thunderstorms, the setup could be right Sunday or Monday, but the ECMWF and GEM don’t show any moisture for storms so I’m not real excited about that possibility right now. 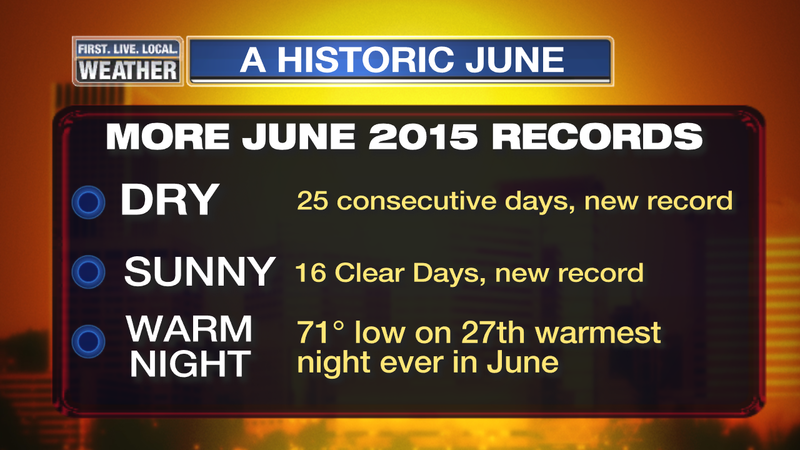 You are currently browsing the FOX 12 Weather Blog blog archives for June, 2015.